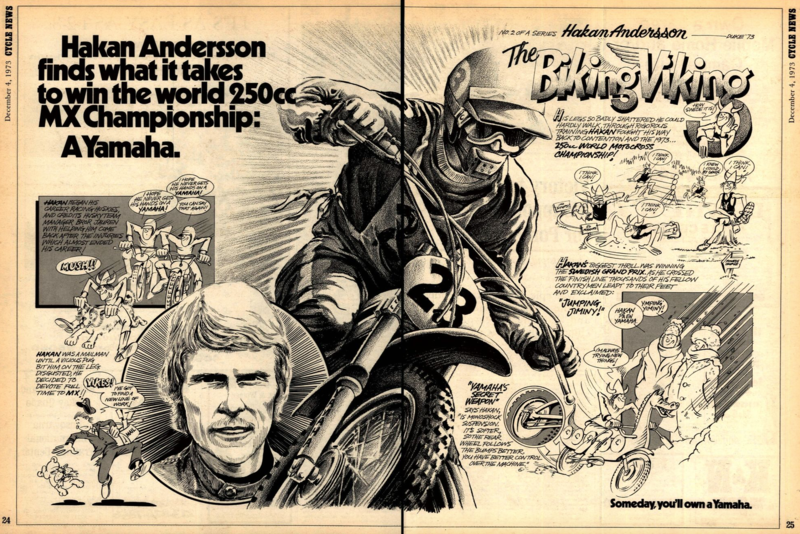 Yamaha ran this advertisement for newly-crowned FIM 250cc Motocross World Champion Hakan Andersson, the man who raced with the first prototype Yamaha Monoshocker, a revolutionary bike that would completely change motocross and the way bikes are suspended. Within a half-dozen years all of Yamaha's competitors were using single-shock motorcycles. His win marked the first world title for Yamaha in Grand Prix motocross. The '73 season started out of course with a first-ever American winner in a Grand Prix as Jim Pomeroy won the Spanish 250cc opener aboard a Bultaco, in what was his first-ever Grand Prix. 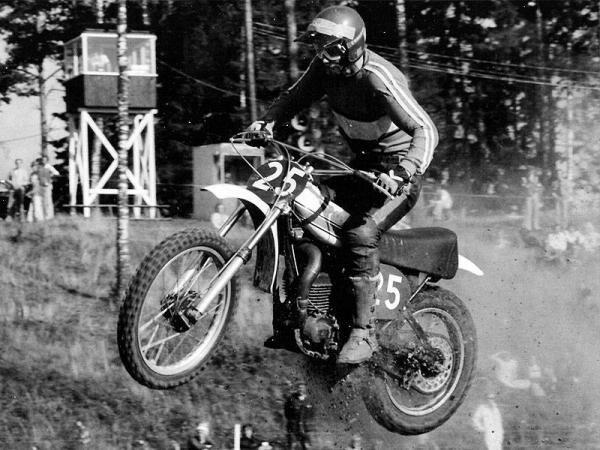 Here is a photo of Andersson in 1973 aboard the revolutionary bike. 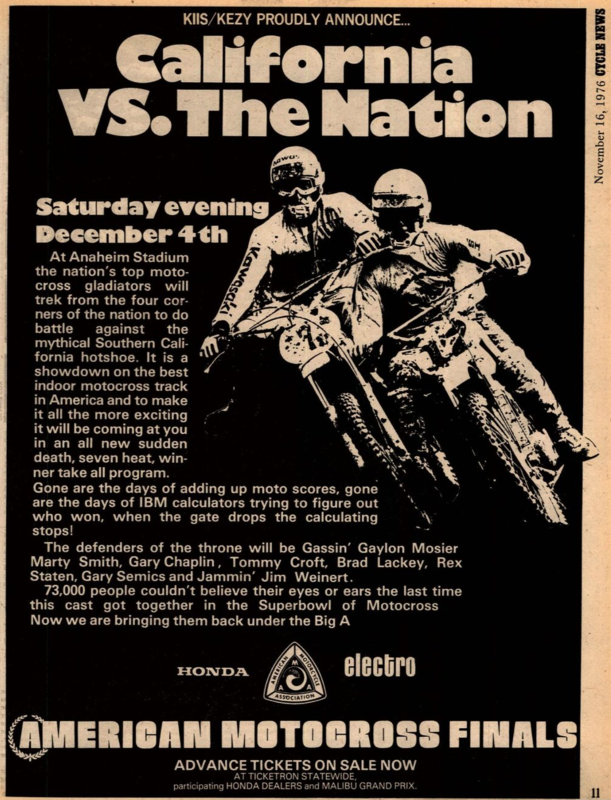 A race billed as the American Motocross Finals would take place at Angel Stadium in Anaheim and Honda's Marty Smith would emerge as the winner for the second time in an AMA Supercross. His Honda teammate Pierre Karsmakers was second, and Husqvarna's Kent Howerton third. Yamaha's rising superstar Bob Hannah and future Honda rider Marty Tripes did not compete over a dispute with the promoter Mike Goodwin over prize money on the track which featured a the massive King Kong Jump made out of scaffolding and dirt. 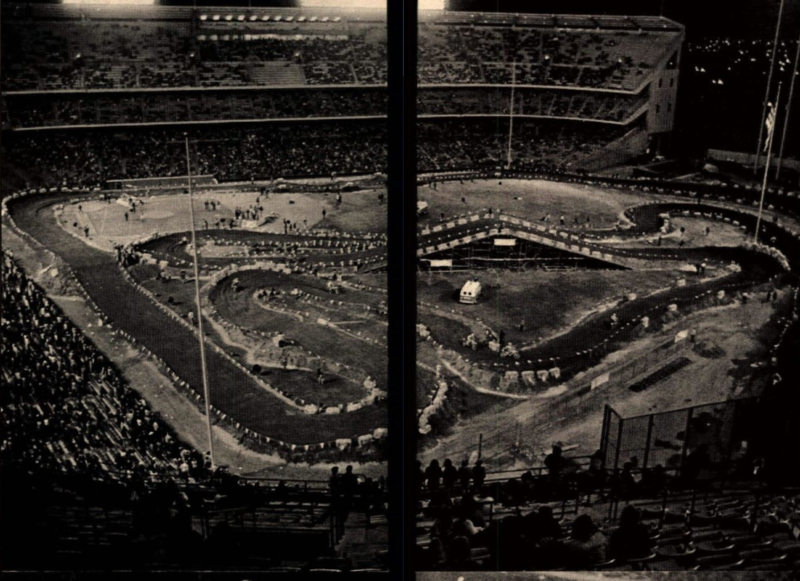 The '76 Anaheim track with it's King Kong jump.